During the several days drive from my home in Minnesota to my primary fieldwork base in New York, I stopped for an evening’s rest in Cleveland, Ohio. Police cars and barricades lined the city’s streets – remnants of the day’s protests in response to the recent acquittal of Michael Brelo, a white police officer involved in the fatal shooting of an unarmed black couple. The Brelo verdict follows several other high profile cases in which a predominantly white police force has not faced legal consequences for fatally wounding unarmed black Americans. Such ongoing racial tensions are inextricably linked to the racial constructions that the American Civil War beget and to the systematic oppression tied to the United States’ slave-built foundation, as I was reminded a week prior during the 150th anniversary march of the Grand Review Parade. An end-of-war celebration to honor the victorious service of Union soldiers, the Grand Review Parade of 1865 included more than 150,000 marchers. Notably absent from these participants, however, were the colored combat units. During the Civil War, United States Colored Troops (USCTs) disproportionately comprised more than ten percent of the Northern Army, though African Americans represented only one percent of the Northern population. Indeed, the history of the USCT’s role in the Civil War is one of which many need reminding, as it is notably absent from common depictions of the Civil War. This absence is political. If it were solely white soldiers and politicians who enabled the emancipation of black Americans, history need not acknowledge the powerful self-determining capacity of America’s black population – their essential role in maintaining the Union and claiming freedom. Narratives of reliance and enslaved helplessness replace such narratives of strength. 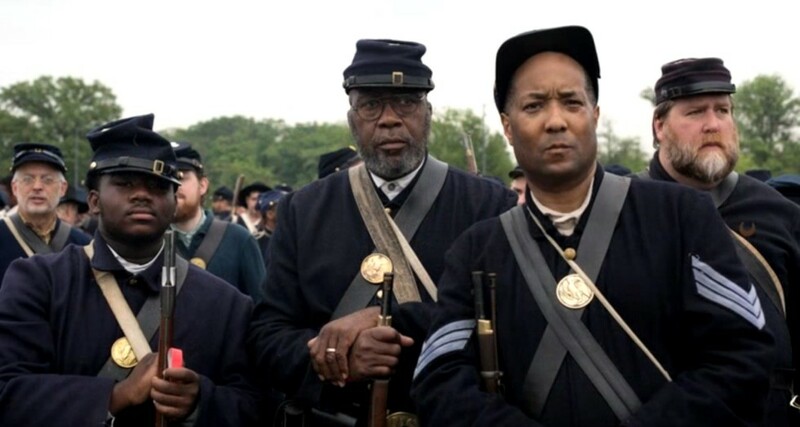 USCT reenactors expressed hope that by relaying their ancestors’ active and essential roles in the Civil War, black youth can see their past as one of power, ultimately empowering them in the present. During this anniversary parade, the presence of USCT descendants, black political leaders, race activists – including freedom riders from the Civil Rights movement – suggests that the stories of the USCTs are inseparable from the 150 years of politicized race relations and historical erasures that have followed the Civil War.